Thanks to my friend Mary, the most productive sew-er and crafter I know, I’ve had a renewed interest in, well, sewing and crafting. During the last several months, I’ve started and finished a number of projects. While I’d like to say I’ve recovered from my procrastinating ways, the truth is that I still have roughly a million unfinished projects around my sewing room. Oh well! Here’s an overview of what I’ve been working on — complete with pictures! 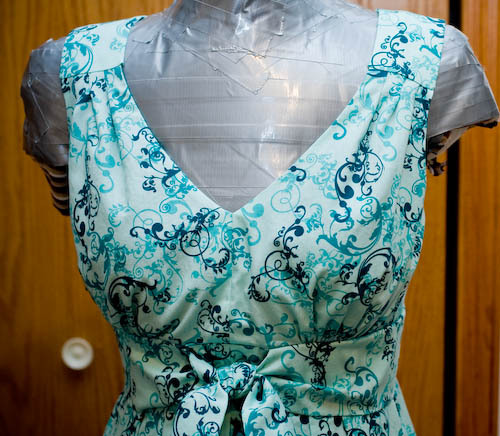 First, there’s my most recent project, which has been on my to-do list for over four years: a custom dress form! I don’t recall if I mentioned this in a previous post, but the last attempt at a custom dress form didn’t go so well. 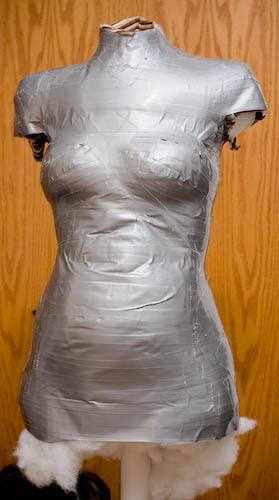 It involves taping me tightly with duct tape, and as I learned the hard way, I pass out when my entire torso is wrapped up. It makes me all claustrophobic and stuff. I paid for an online class after this fiasco — this was almost exactly four years ago. This particular taping system leaves the tummy and chest untaped until the end. I guess I didn’t have any real reason for putting off making a dress form for so long, but I recently discovered that I couldn’t go without one any longer. So I enlisted the help of John and Mary to tape me. Last weekend was the scheduled taping date. This time, the taping went much better. Until the end. As soon as the tape started going up my neck, I suddenly got that familiar clammy, hyperventilating feeling. Luckily, the form was pretty much done by then, but it definitely was not my finest moment there at the end. I’ll just skip over the details. The good news is that I now have an almost-completed form. 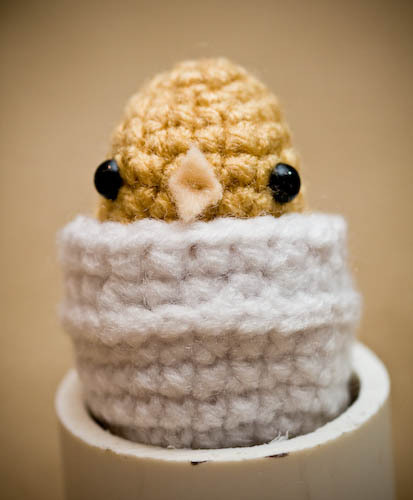 I just need to double-check the stuffing, tape up the back, make a cardboard bottom, and make a cover. The bad news is that the form isn’t as exact as it could be. It’s about an inch larger than my actual circumference measurements at the waist and hips. 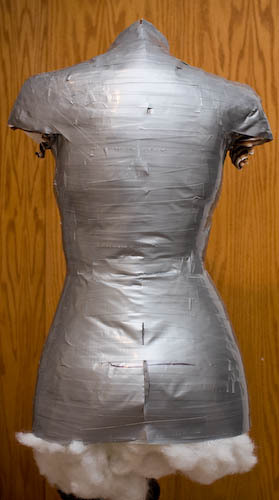 And…well, let’s just lay that taping during severe PMS and directly following a large meal is not advised when you want an accurate dress form in the stomach area. The belly protrudes out about two inches further than my actual measurements. As John pointed out, at least I’ll be able to eat large meals and breathe easily in whatever clothes I make. Next we have some items that I finished in April, but didn’t have a spiffy dress form to put them on. The first is the last of three tiered skirts that I bought material for over a year ago. This one was a particularly tricky polyester material that did not want to stay on grain. 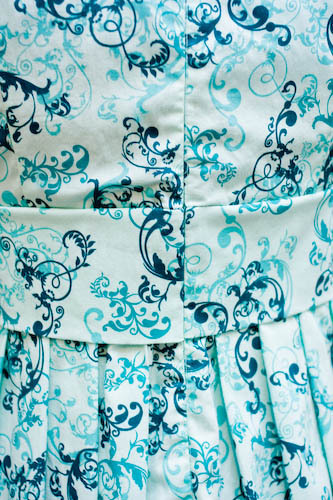 Luckily, the fabric design, color, and nature of the skirt pattern helped cover up my off-grain cutting. 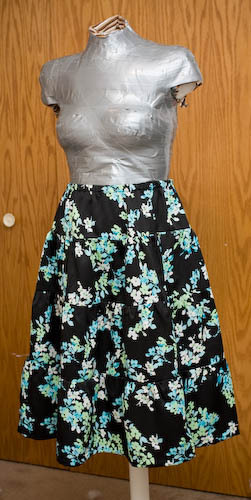 I painstakingly hand-hemmed the skirt to prevent the problems I had with the other two. I bought some material at CraftyPlanet and sewed up Simplicity 3867. I made a test garment from muslin first, and to my great surprise, the pattern fit without any alterations. Which is good, because I didn’t have the dress form when I made it. The dress includes pleats at the front shoulder and the skirt. 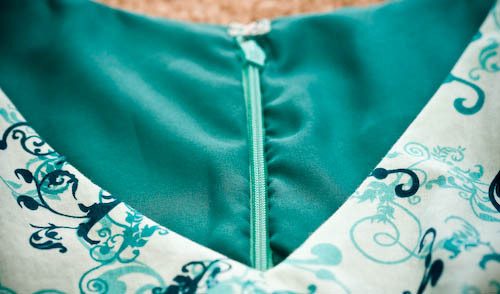 The bodice is lined, and although the pattern instructions have the raw edge of the zipper tape exposed (sewn on top of the lining), I changed the instructions to cover the raw edge of the zipper with the lining. 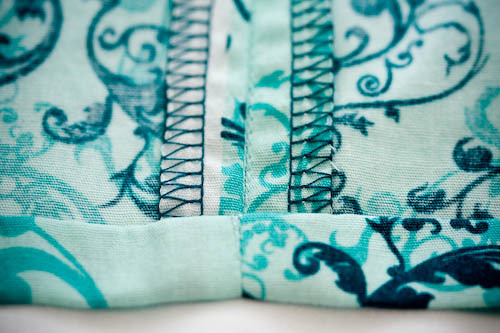 I also finished the inside edges with my serger. I used an invisible zipper instead of a regular zipper (and changed the pattern instructions accordingly) and did a hand hem. I’m finding that I get much better results when hemming by hand, even though it takes a lot longer. Sewing isn’t the only thing I’ve been up to. I bought some earring kits at The Bead Monkey. I put them together last month. One goes with the mauve tiered skirt I sewed a year ago and the other goes with my summer dress. 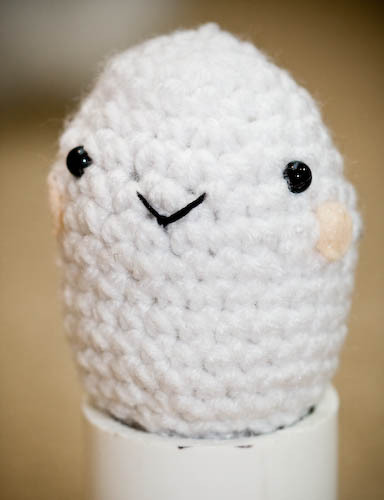 Last but not least, I was inspired by a recent post on the CraftStylish blog and decided to try my hand at Amigurumi. I picked up this book and learned some basic crochet stitches. Having never crocheted before, I’m very, very bad at it, but I still completed a couple of small pieces from the book. I’ll post them here for amusement value. Whew! That’s quite a lot of stuff. 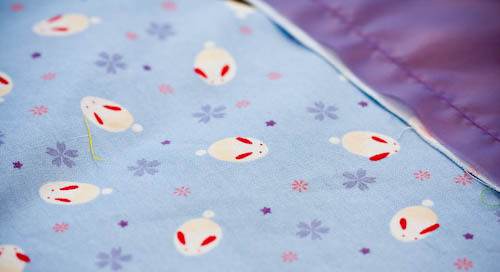 I also finished the bunny decoration for Mary, but stupidly forgot to take pictures of it. Derp! More updates to come! For real!